As with most dog breeds, the Black Russian Terrier can be susceptible to a variety of eye diseases or conditions. Some are genetic or inherited while others may be acquired. Some have potential to be quite serious while others are nothing more than a nuisance. Following are some eye problems that may occur in a BRT, along with descriptions and what you can expect and should do. I’m not a veterinary ophthalmologist but am passionate about eye diseases and cases. I perform a wide variety of eye procedures, from simple growth removals to delicate corneal graphs. After seeing and treating a significant number of canine eye problems over two decades, I hope this article is informative and useful in helping you consider what might be affecting your BRT should any of these conditions arise, and to help you know when and why to seek veterinary or specialist care. • Distichiasis is a condition in which eyelashes grow from the tarsal glands (sebaceous follicles between the cartilage and conjunctiva of the eyelids) in an improper direction, often growing backward toward the cornea. This is considered a commonly inherited disease among many breeds. If present, it will be found and noted by a board certified veterinary ophthalmologist during Canine Eye Registry Foundation (CERF) exams. • Trichiasis occurs when eyelashes grow from the tarsal glands in the proper orientation but become directed or curl backward toward the eye. The net effect of these conditions is irritation to the cornea, which may present itself as a red, irritated eye with discharge, blepharospasm (squinting) and discoloration of the cornea from chronic irritation or even ulceration of the cornea. Treatment is directed at removing offending eyelashes. This may be as simple as plucking the lashes (they will frequently regrow); removal of eyelashes via electrolysis to try and prevent regrowth; cryotherapy (freezing the eyelid margin) to remove abnormal lashes and prevent regrowth; or even surgery to remove a portion of the eyelid containing abnormal eyelashes (not usually necessary). Entropion is another disease of the canine eyelids in which the upper and/or lower eyelids roll inward. This causes eyelashes and hair on eyelids to rub against the cornea and result in pain, blepharospasm (squinting), a red/irritated eye (conjunctivitis), and sometimes corneal scarring or ulceration. • Inherited entropion is the most common form, and as the name implies, it is genetic in nature. It is often diagnosed in young dogs. • Spastic entropion is a secondary condition cause by excessive squinting, usually secondary to a painful eye. Dogs can squint so much that eyelids start to roll inward. • Acquired entropion can be seen in older dogs secondary to enopthalmos (eyeball is abnormally positioned), or from chronic untreated spastic entropion. 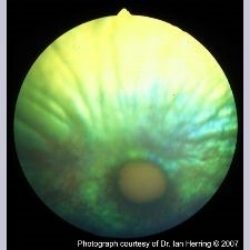 Diagnosis of entropion is straightforward as it is detected during a simple eye exam. Treatment involves surgical revision of the eyelids. There are several techniques to correct it. In some puppies, an entropic condition may develop at a very young age. Sometimes a puppy may outgrow the condition. To prevent damage to the cornea from the inward-turned eyelids, a temporary tacking suture can be placed to pull the eyelid away from the globe (this is very common in Shar-Pei dogs). There are believed to be several genes involved in the inheritance of entropion. It is not recommended to breed affected dogs. Also, it should be noted that the AKC does not allow for the showing of a dog with entropion that has been surgically corrected. Progressive retinal atrophy describes a collection of conditions affecting the canine retina. It often presents as a chronic, slowly progressive deterioration of the cells of the retina, eventually leading to blindness. The age of onset is variable but usually occurs in young adult dogs. Owners often first notice vision problems at night or during low-light situations. The dog may seem hesitant to go down stairs or may start bumping into things. Often, the pupils will remain dilated. The length of time from onset of symptoms to complete blindness is variable, but usually will occur within one year. How is PRA diagnosed? An ocular exam by a veterinarian or ophthalmologist will reveal a slow pupillary light reflex and hyper-reflexic retina. A fundic (retinal) exam will show a thin retina with attenuated (shrunken) or absent blood vessels. The ocular nerve may be pale. A referral to a veterinary ophthalmologist will likely be recommended to confirm the diagnosis. Most veterinary ophthalmologists readily recognize changes present with PRA; however, an electroretinogram (ERG) can confirm the diagnosis. Is there a cure? Unfortunately, there is no known effective treatment for PRA in dogs. If your dog is diagnosed with PRA, you should begin to make preparations to assist your companion as his vision fades. A safe home environment for a blinding dog is important. You may also want to work on games that involve noise or smell to help hone your dog’s skills and help him adapt to his decreasing vision. It is important that the environment stay consistent – do not rearrange the furniture! 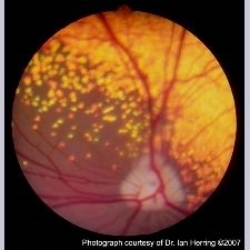 Newer research shows an antioxidant supplement marketed as Ocu-GLO RX™ (www.ocuglo.com) may aid in the slowing of the retinal degeneration and delay the onset of blindness in canine PRA. I have no experience with this product but with no other treatment options available it is likely worth trying; however, I recommend first consulting your veterinary ophthalmologist. Several breeds known to have high incidence rates of PRA have had DNA tests developed to help diagnose PRA before dogs are bred and the trait passed on. Most PRA conditions are passed on via an autosomal recessive gene and can quite easily be bred against – although this is not true in all breeds. As of 2012, I have found no references to the mode of inheritance of PRA in Black Russian Terriers or any literature as to what the incidence rates may currently be. I do know of one affected BRT; however, and suspect it is occasionally seen but likely not often reported. A true incidence rate may never be known. Growths on the eyelids of dogs are not uncommon. Most are nothing more than a nuisance; however, some types can be malignant and others may get large enough to rub on or damage the cornea. The most common eyelid growth is a meibomian gland adenoma. This is a benign growth arising from one of the glands located at the margin of the eyelid. Most of the time these do not get very large, but sometimes they may angle toward the eye and rub the cornea, necessitating their removal. Another growth you may note on the eyelid is the chalazion. This is actually a blocked gland better known to people as a sty, or stye. These only need to be treated if they are bothering the dog. Sometimes they respond to warm compresses. If not, they may need to be lanced or surgically removed. There are many other growths that may arise on eyelids, such as mast cell tumors, melanomas and squamous cell carcinomas, among others. These have the potential to be very serious and require surgical removal and possibly other adjunct treatments. Bottom line: If you notice a growth on your BRT’s eyelid, have it checked so that treatment can be performed if necessary. Cherry eye is a term used to describe the prolapse of the gland of the third eyelid. When this gland prolapses, you will notice a red bulge at the medial canthus (the corner of the eye by the nose). Sometimes if it is a recent prolapse, the gland can be gently pushed back in to place; however, often the cartilage stalk that attaches to the gland becomes bent, causing the gland to immediately re-prolapse. • The first and preferred procedure is to surgically reposition the gland back into place. The cartilage stalk is severed to prevent the gland from popping back out. This delicate surgery may be referred to a veterinary ophthalmologist for the procedure. • The second procedure involves completely removing the gland. The dog is sedated, The gland is numbed and clamped, then excised with surgical scissors. The procedure is fairly simple and quick; however, some eyes may not produce enough tears following gland removal, necessitating use of eye drops or tear stimulators. My preference is to reposition the gland; however, due to financial constraints on many clients, I have performed many excisions as well. I have very rarely encountered inadequate tear production following gland excision. The cornea is the thin clear layer of the eye enveloping the anterior chamber of the globe. The cornea is frequently injured due to rubbing or trauma to the eye. Any damage to the cornea will usually present as a painful, red, uncomfortable eye. You may or may not be able to see the injury depending on its size. A corneal injury can be as simple as a small scratch, or a much larger defect that could lead to perforation. You will often note the dog squinting or pawing at its eye when a corneal injury is present. Due to the delicate nature of the cornea and its importance to the eye and maintaining good vision, any time a corneal injury is suspected it should be treated as an emergency and be seen by the veterinarian as soon as possible. The veterinarian may need to perform a fluorescein dye test to highlight the injury if it is not readily apparent. Most corneal injuries heal with just supportive treatment. Generally, a topical antibiotic is used, as well as oral pain medicine for discomfort. Corneas can be slow to heal, though, due to the lack of a blood supply (the cornea will actually grow small blood vessels to heal the injury). A new medicine called Remend™ can help speed corneal healing. Sometimes the cornea may fail to respond to treatment and more advanced procedures may be needed to stimulate healing. If it is deemed the cornea may be in danger of rupturing, a corneal graph may be placed to immediately add strength and healing to the injured eye. Frequent rechecks will often be recommended to assess healing progress. Glaucoma is defined as an increase in the intraocular pressure (the fluid pressure inside the eye). It can be present in one or both eyes, and can be acute (occurring very rapidly) or chronic. Normal eye pressure in a dog is approximately 15 mmHg (millimeters of mercury) but may range from 10-30. Anything over 30 mmHg is considered glaucoma and should be considered an emergency. An eye pressure persistently elevated over 40 mmHg can cause blindness in as few as 48 hours. Appearance: A glaucomatous eye generally appears to be red and painful. It may take on a buphthalmic (enlarged/bulging eye) appearance, and the cornea may appear hazy. Causes: Glaucoma can be genetic (primary) or acquired (secondary). I have found no references to primary glaucoma in the Black Russian Terrier. Cocker Spaniels, Beagles, Samoyeds and several other breeds have primary/genetic glaucoma in their lines. Secondary glaucoma can be seen in any dog and be a result of a variety of causes, including trauma, uveitis (inflammation or infection of the uveal layers of the eye), displaced lens, and neoplasia, among others. The diagnosis of glaucoma is straightforward. Eye pressure is measured and anything over 30 mmHg is considered positive, although the root cause of elevated pressure may not be readily apparent. Treatment focuses on lowering eye pressure. If cause can be determined and corrected, that is the focus of treatment. If no primary cause is determined, there are medical and surgical treatment options. • Medical management is the most common and preferred modality. This may consist of a variety of medicines, oral or topical, designed to decrease fluid production in the eye, decrease pain and inflammation and speed fluid removal from the eye. Medical therapy is often a lifelong endeavor. It is difficult to continuously keep eye pressure down, thus keeping the eye comfortable and visual. • There are several surgical options for the treatment of glaucoma with variable success rates. Most commonly, these procedures try to improve the drainage of the aqueous from the eye, thus reducing pressure; however, unfortunately, even with prompt diagnosis and treatment, a lot of times a glaucomatous eye will become a blind eye. If pressure continues to elevate, it will be a blind PAINFUL eye. In this situation, chemical ablation (injecting gentamycin into the eye to prevent fluid production, thus permanently ending the glaucoma), or enucleation, should be considered for the dog’s comfort. An intraocular prosthesis can be placed if desired. Red eye is simply the term given to describe the many conditions described above, plus others, in which the canine eye becomes inflamed and/or red. After reading about the above eye diseases, it should be readily apparent that a red, irritated eye could be brought about from a number of diverse conditions. Things as minor as allergies, or as dreadful as glaucoma, or a deep corneal ulcer, can produce a red, irritated eye. If you ever find your BRT to have a red eye or eyes (assuming you can see your BRT’s eyes! ), it is important to have a veterinarian assess it. Most likely it will be something minor and easily treatable; however, more significant and serious problems may be present that you will want to know about and seek preventive or proper treatment. It may be very difficult for you to determine what is causing irritation or redness. With the delicate nature of the canine eye, a prompt and thorough eye examination by a veterinarian is certainly warranted.